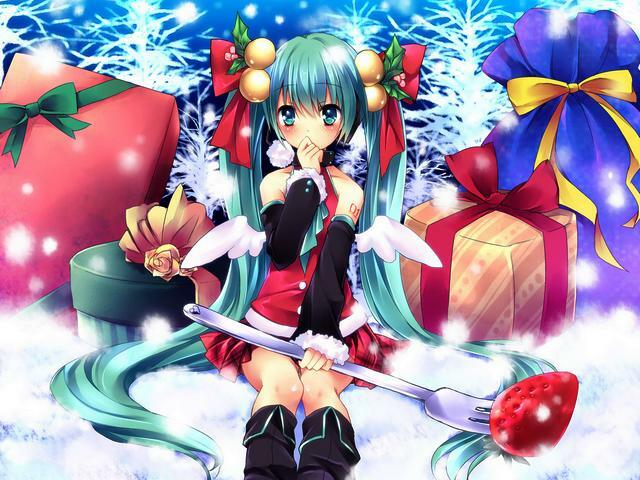 Christmas wallpaper with Hatsune Miku, a beautiful anime girl with long pigtails, painted by the Japanese manga artist Sorai Shinya. Hatsune Miku, which became a Japanese pop idol, is a software synthesizer (singing computer), created by Crypton Future Media (2007). The name of the most popular Vocaloid2 is combined of Hatsu (first), Ne (sound) and Miku (future), meaning 'the first sound from the future'.